Sziget Cultural Management presents the biggest snow festival of the region at the end of November. Fridge is already known in Hungary, but this year the festival fans can enjoy the event parallel in Vienna as well. The event merges the most spectacular winter sports with all-star music performers. The preparations for one of the biggest winter festivals of Europe, Fridge, have started after a one year break. The event was already known in Hungary and this year it will be co-organized by Sziget Cultural Management, the company organizing VOLT Festival, MasterCard Balaton Sound and Sziget Festival. This year Fridge will not only take place at the Hungexpo venue of Budapest, but at the same time the event will have a debut in Vienna, as well. 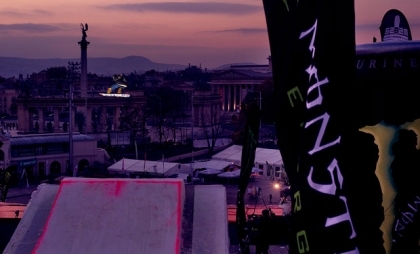 The 34-meter high and 100 meter long ski and snowboard ramp will move from Budapest to Vienna, where the winter sports fans can check out the AFP Gold Big Air competition, followed by a 4star TTR snowboard contest with the best riders around the globe. Meanwhile in Budapest a never seen show by the snowmobiles, Ski-doos will be introduced. The contestants are already well-known from X-Games and they will definitely make a spectacular show for all visitors. Good news for the winter sports fans, that during Fridge in Budapest a Snow Show will take place at Hungexpo where the visitors can gather everything necessary for the winter: starting from winter travel packages both in Hungary and abroad through sports equipments and goods one might need for the season. The showcase in November will also feature a gastro festival, bringing the real hütte atmosphere, where visitors can sip some mulled wine, or try out several winter drinks and food. Those with a Fridge ticket can check out the Snow Show as well. Fridge Budapest and the Snow Show will take place between 21-24 November, while Fridge Vienna is held between 22-23 November. The details of the spectacular sports events and the exciting line-ups will be revealed by the organizers in the upcoming weeks.